Between non-Millionaire and Millionaire investors surveyed by Spectrem Group in April, the non-Millionaires were slightly more likely to say market conditions is the primary factor affecting their current investment plans (31 percent vs. 30 percent). Retirement, too, is another area considered more by non-Millionaires to be a factor most impacting their investment plans today (20 percent vs. 18 percent). Millionaires, on the other hand, were more likely than non-Millionaires to consider the economic environment when making their investment plans (14 percent vs. 10 percent). 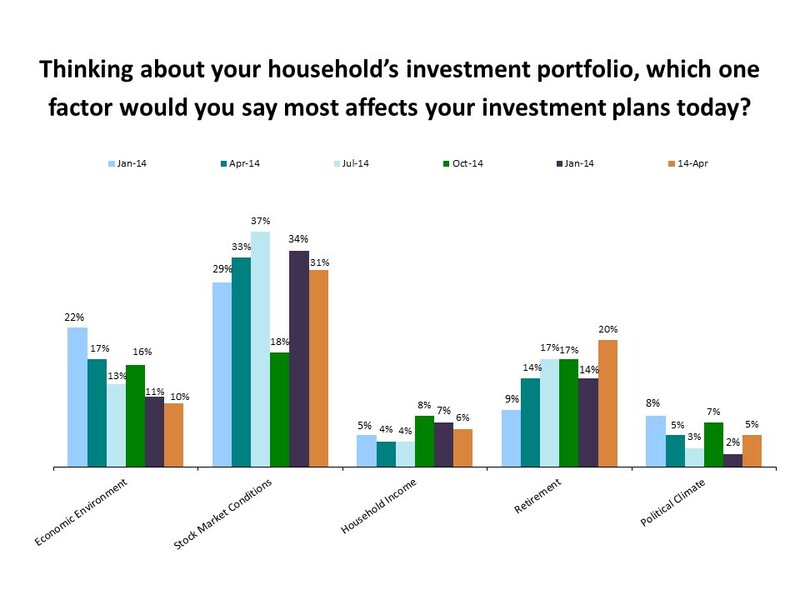 Eight percent (vs. 6 percent of non-Millionaires) said that household income is the primary factor most affecting their investment plans. The political climate and the perception that the White House and Congress cannot or will not work together in fixing the country’s economy, is taken into consideration by a slightly higher percentage of Millionaire investors than their non-Millionaire counterparts (6 percent vs. 5 percent. The market thus far in 2014 has been more volatile, which has kept investors on edge. April has been rough overall. The S&P and Dow are up only slightly for the month, but the NASDAQ suffered a dramatic drop as investors soured on many tech and bio tech stocks. An increasing percentage of Affluent investors said this month that retirement is the primary factor affecting their investment plans (20 percent vs. 14 percent in January when this question was last asked. Running out of money in retirement is the biggest financial fear among Affluent Americans, according to Spectrem Group research. Ten percent of Affluent respondents said that the economic environment is most affecting their investment plans, basically unchanged from three months ago.